Organizers of the Great City Games in Manchester have announced that they will take place as planned despite Monday’s (May 22) terrorist attack. The event is due to take over the streets of the city on Friday (May 26) at a purpose built athletics arena in Albert Square. In a statement organizers stated that installation work on the Deansgate venue began last night and would continue over the course of this week. 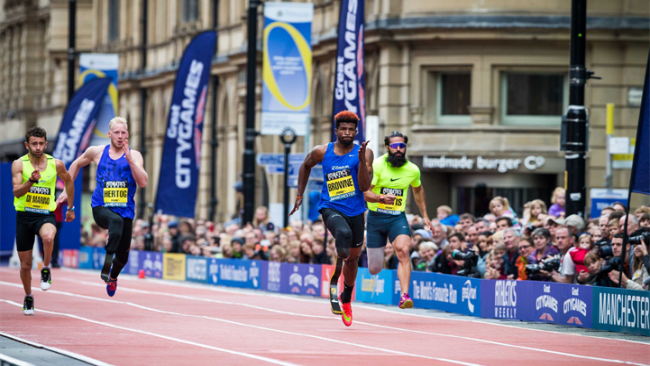 “Following consultation with Greater Manchester Police and Manchester City Council, we can confirm that the Arcadis Great CityGames scheduled for the evening of Friday 26 May will be staged as planned,” officials said. The GreatCity Games is due to feature 12 athletics events. Among the leading names due to compete are St Kitts and Nevis sprinter Kim Collins, the 2003 world 100 meter champion, and Britain’s Rio 2016 4x100m bronze medalists Asha Philip and Desiree Henry. It remains to be seen whether the incident will affect the Great Manchester Run, which includes a half marathon and a 10 kilometer race. The event is due to take place on Sunday (May 28) and organizers have said a decision will be made in the next 24 hours. Police have confirmed at least 22 people including children as young as eight-years-old have died and a further 64 people are injured as a result of the attack at the Manchester Arena, the largest venue of its type in Great Britain. A lone attacker, named as 22-year-old Salman Abedi, is believed to have detonated an explosive device at the arena as people left a concert by American singer Ariana Grande. They have also confirmed that a 23-year-old man has been arrested in the city in connection with the incident. Along with this, the force carried out raids in the Whalley Range and Fallowfield areas of Manchester as part of their investigations, with a controlled explosion being conducted at the latter venue. Today, Greater Manchester Police said they had arrested three more men in south Manchester in connection with the incident. Responsibility for the attack has been claimed by the so-called Islamic State group.